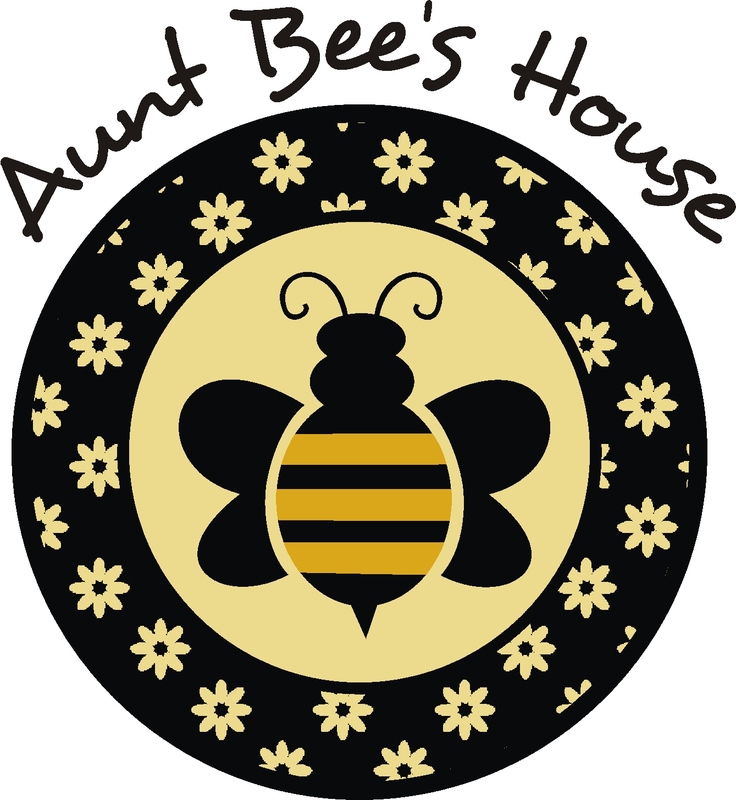 Before I get going here, I just want to say thank you so much for all the encouraging and sweet comments on my new space at Aunt Bee's House. Sometimes I get so focused on the next project, that I forget to say "thank you"! I've had this mirror for about 8 months now. I really liked it when I found it. There are a lot of gold mirrors out there that I'm not crazy about, but this one was really pretty with all the detail on it. Lots of other people have looked at it- briefly. And then walked away from it. I even marked it down- still no. So, I decided to give the ol' girl a makeover. I've posted before pics before on here, but for the sake of time, here was the pre makeover shot. On Pinterest, I had seen Donna from The Decorated House do a similar makeover, and I knew this would be a great project for my own mirror. I started by painting a quick coat of Annie Sloan's Duck Egg Blue as the first layer. As it was beginning to dry, I took a damp rag and began wiping some of the paint off so the gold was peeking through. I let that dry for a couple hours, then dry brushed Paris Gray over the first layer. Again, as it was beginning to dry, I wiped off some of the paint to expose some of the gold details of the mirror. As a final step, I waxed everything in clear and dark wax. Are you ready to see her now? It almost looks like copper that has patina. What do you think? Better? An improvement? Let's see if she goes home with someone now! I just ordered (yesterday) my ASCP and it will be here on Thursday. Perhaps next week, I'll be able to get at a couple of the projects awaiting me. I can't wait. I am a follower and also have your Blog Button on my Blog Button Tab. Please stop by - I'm having a Give-Away, too!! TOO pretty! Love the makeover! yes...way better. she'll go home in a hurry. Hello! Love the mirror transformation! It turned out beautifully! I was at the shop last night chatting with dealers and we were all doing the same thing...taking home things that hadn't sold to give them a coat of paint and a new look. A couple of dealers were there with paintbrushes in hand, working right there on the spot! I know your mirror will sell with it's new aged copper patina! It's just lovely! Oh thank you so much for this post. 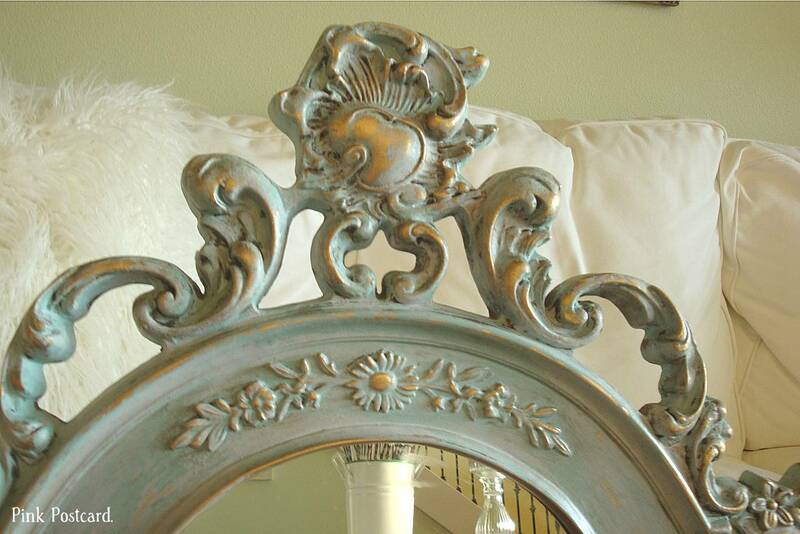 I have a couple of gold ornate mirrors that I've had a few years and just tired of the gold. 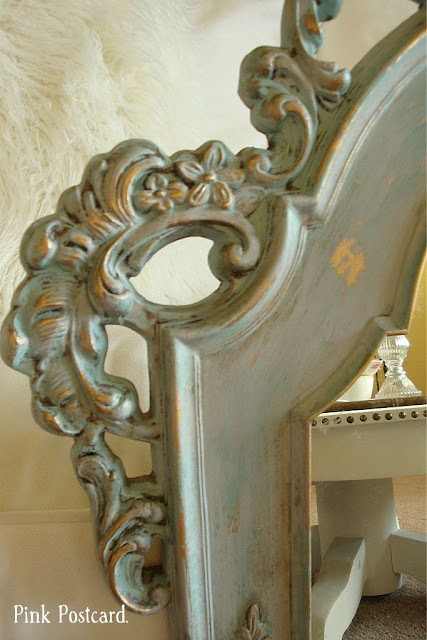 This is the look I love and would so go with my room. I'm a new follower and hope you'll share this tomorrow at my Frugal Treasures party! Thanks again for sharing. Beautiful Denise! I predict she's gone by Monday! She's beautiful! And she'll be snapped up in a flash! Your mirror is so beautiful! You've inspired me to try that on one of my mirrors! Huge improvement! That mirror is gorgeous---now! I can't imagine your mirror won't fly out of your shop now. It's beautiful! I absolutely love this! 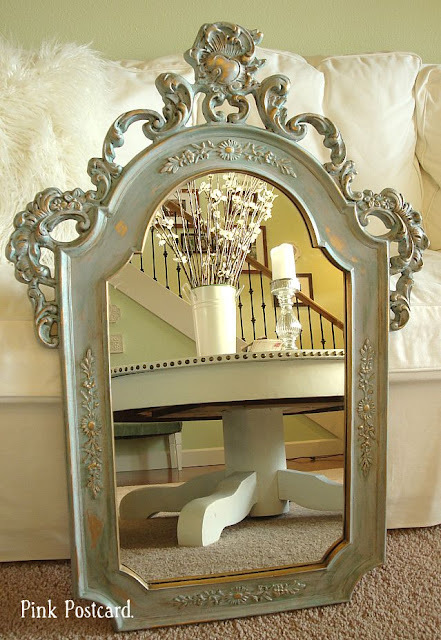 I have a similar mirror I've been wondering how to revamp. This might just be it! GASP! She looks like a crazy expensive french antique now! Gorgeous! People will trip over themselves trying to buy her before anyone else does! 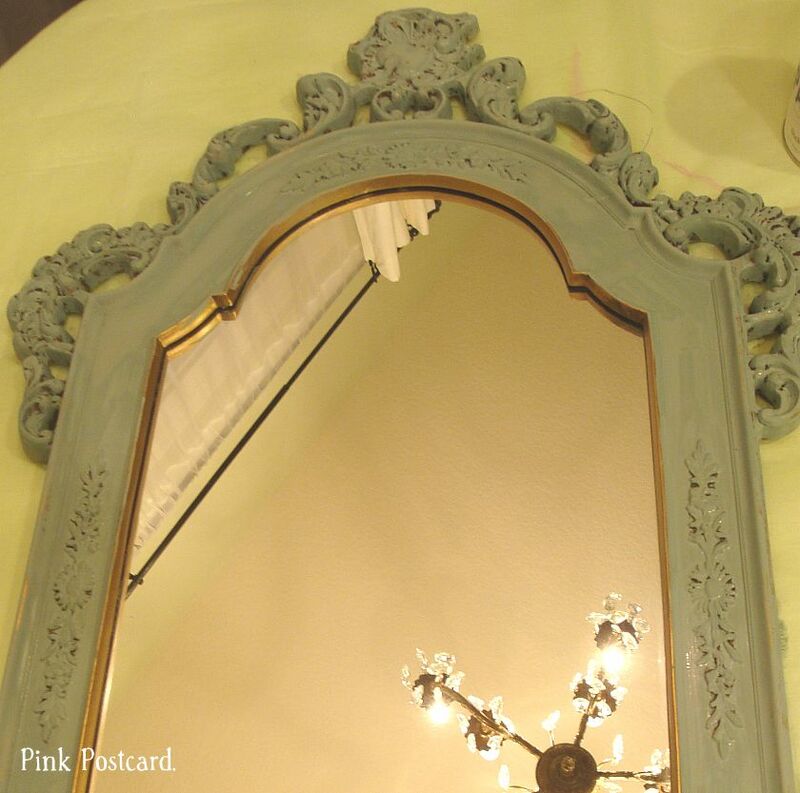 Your mirror was one of the most popular links at our party this week Denise! We featured you this morning. And after only a few weeks, this was your second feature already. Thanks so much for joining us! Hope you'll be a party regular! This looks beautiful. 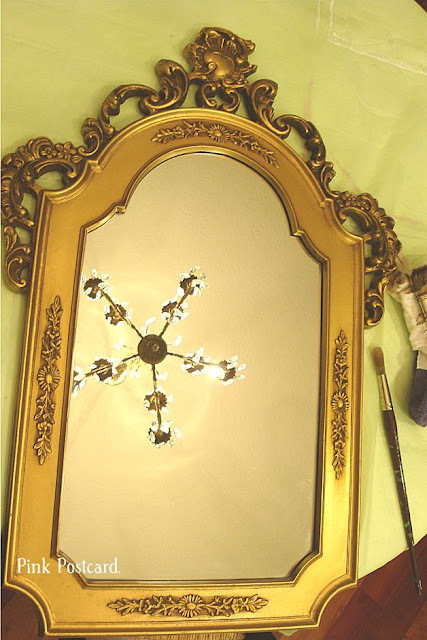 I have a beautiful ornate gold mirror and want to paint it...but I don't have the nerve! But I do have another one I am going to paint.